I want to wish you a happy new month joyfully. May this new month bring you more awesome goodies and favor than the previous month. Cheers to a fabulous new month. (That wish is from me to you). Now, if you need some new month wishes, you are in the right spot. 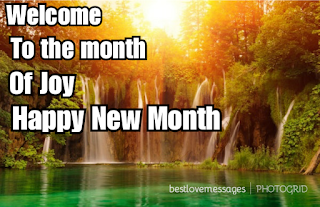 Send happy new month wishes and messages to friends and family to start their new month in a happy note. 1. I Wish you a happy new month with lots of blessings and fulfilments. This new month has a lot of glory for you in-store. What you lost last month you shall regain this month. Happy New Month! 2. This new month shall take back all the negativities of the past months and bestow upon you the abundance of positivities and make your life more fabulous than it was. I wish you the best in this new month. 3. This New Month shall embrace you with loads of love and decorate you with colors Of blessings like a rainbow to make your life worth the best in the world. Happy New Month, dear! 4. If you didn’t achieve what you wished and hoped for last month, don’t worry. Another new month is here for all your unfulfilled wishes and expects to come to past. Happy New Month. 5. Unlike other months, this New Month will not only make you older but will also make you wiser and greater. Welcome to the month of greatness. You are a blessing to me. Happy New Month. 6. New Month, New Hope, New Blessings, New Life, New Fulfilment, New Health New Goals, New Joy, New Songs, and New Challenges. This New month you shall conquer every challenge that crosses your path and achieve your goals. Happy New month. 7. This New Month shall bring a plethora of changes in your life. This changes shall be positive changes. It will move your life to a greater height. I want you to expect everything to turn around for your good. Happy New Month, my dear. 8. Here is another New Month. The newness of the month shall bring you unlimited happiness. This month shall rain blessings on you. This New month shall mark the beginning of God’s work in your life. I wish you a lovely and Happy New month. 9. This New Month you shall be as bright as the moon, you shall shine like the sun. You will be of value like Diamonds. This New Month shall bring you divine blessings. I wish you a pleasant and happy new month. 10. May This New Month Bring you Happiness, Success and a life filled with Peace, Hope, and Togetherness of your Family and Friend. I wish you a Happy New Month. 11. Wishing you a New Month that is Sparking with Fun and Masti, Bursting with Joy and Love and crackling with Cheers and Laughter! Happy New Month. Have a blast. 12. May this brand New Month discover and make you Fresher, Happier, Healthier, More Joyful, More Cheerful and More Satisfied. I wish you a Happy New Month. 13. Somethings may be left undone, and some words may be left unsaid. Some feelings may be left unexpressed, but a person like you can never be forgotten. I wish you a Happy New Month. 14. Lighten up your environment with your brightest smiles and make way for cheers with your good deeds this New Month. It’s going to be a month of blessing and fulfillment. May the rest of your days be memorable. 15. May this New Month bring you Happiness, not Tears, Joy and not Sorrow. Always remember that in this New Month, all your problems must meet its end. Have a lovely New Month. 16. May this New Month fill your heart with Love, Hope, Faith, Cheers, Happiness, Tranquility, and peace. I Wish you a Happy New Month devoid of pains! 17. In this New Month, may God bless you with style to convert all your dreams which you couldn’t achieve these past months into reality in this New Month. I wish to say a Happy New Month to you. 18. Do away with Hate, Lust, Jealousy, Grudge, Animosity, Greed from your heart this New Month and replace them with Love, Commitment, Support, Compassion, Honesty, and Contentment, I wish you a very Happy New Month. 19. In life, there is a season for everything, a time to be Sad and a time to be Happy. I pray that this New Month brings to you happiness and joy forever and ever. I wish you a lovely New Month. 20. On my way to this month, I met Peace, Happiness, Harmony, Love, Good Health and Joy. They needed a permanent site to erect their structures. So I gave them your address, and I hope they will arrive safely. Happy New Month. 21. May the light of greatness shine upon your life this New Month and fill your days with the blessings of Peace, Happiness, and Goodwill. Happy New Month. 22. I wish you a month of Happiness, Success, Peace, Prosperity, Good Health and Wealth, Also a New Month of Love and Laughter. Happy New Month. 23. 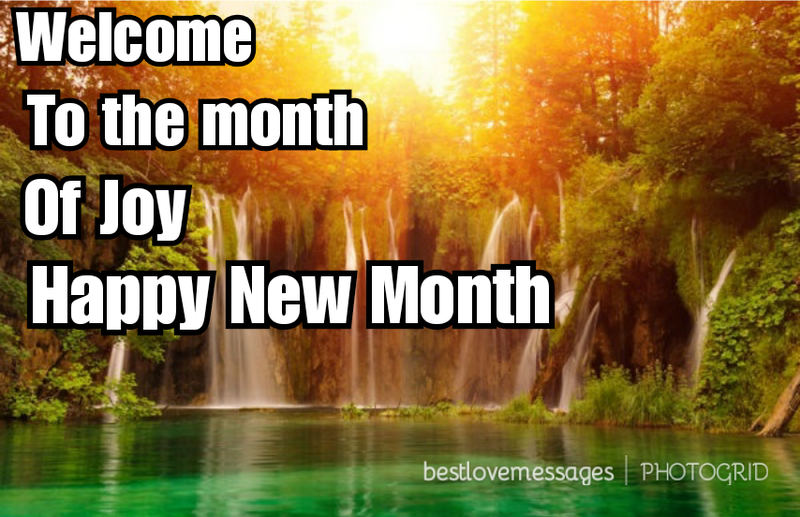 May this New Month Open up for you Good Ways, Fill your heart with New Hopes and bring for you Promises of Better Days! I wish you a Happy and Prosperous New Month! 24. I pray that throughout this New Month may your life be filled with the celebration of Happiness and Joy. I Wish you a Joyous, Happy and Prosperous New Month with God’s Blessings. Happy New Month. 25. It’s a New Month! I pray that this New Month brings the warmth of love and lead your path of life towards a positive direction that will bring out the best of you. Happy New Month. 26. I Hope this New Month reignites your hopes and courage, alongside the passion and zeal to achieve your desires. I wish you all the best this month could offer. Happy New Month. 27. May this New Month strengthen you with the courage and zeal to conquer your challenges and convert them to positivity. I wish you greater heights this New Month. Happy New Month, dear. 28. In this New Month, may you view the world with a positive outlook, speak your heart out with confidence, listen to others as well as your inner voice and you will be on the right road in the right direction. Happy New Month. 29. May you be blessed abundantly to spend this New Month with your parents, friends and loved ones. Be grateful, and you will have only good things come your way this Month. Happy New Month! 30. To put an end to something old, we have to start something new, that is the reason why last month ended for this new month to start. I wish you a Happy and Lovely New Month with a joy-filled heart. Happy New Month. 31. Hope you scatter Joy and Happiness wherever you go this New Month and get the same in return. I wish you greatness and more grace this New Month. Happy New Month to you! 32. Every New Month gives us the perfect opportunity to start something new and fresh. So do your bit this New Month and make the world a better place for yourself and others. Happy New Month! 33. May God bless you and keep you protected and in good health so that you can witness many more such New Months! But first of all, enjoy this New Month and stay happy! Happy New Month, my dear. 34. Even though last month presented to you various obstacles and hurdles, be proud that you managed to overcome all and cross the bridge to another New Month. May you continue to be this firm and win over all your shortcomings. Happy New Month. 35. May this New Month bring you a peace filled life, warmth and togetherness in your family and much prosperity! Happy New Month! 36. When the New Month arrives, it brings along sets of new ideas and ways to make our lives from good to better and ultimately from better to best. Happy Lovely New Month. 37. I wish that this New Month turn out to be an exceptional one for you, filling each day with a peak of health, an abundance of happiness and sunshine, bountiful luxury and prosperity and Zen-like serenity. 38. May God spread the peace all around and bring success to you and everyone around your life this New Month. Happy New Month.! 39. May you experience the delight of love that will calm all tears away, bring genuine companions to stroll close to you, through every single day of this New Month. Happy New Month! 40. May this New Month be brighter than the past one, enveloped in goodness and wellbeing, bliss and endowments. Happy New Month. 41. Let this New Month give you all the strength and courage to conquer Negativity and convert them to enhance your positivity. Happy New Month. 42. In this New Month may we continue to share the genuine relationship that adds happiness and brings warm blessings to our lives. Happy New Month. 43. Have it at the back of your heart that each day of the New Month would keep making your good to get better and your better to become best. Happy New Month. 44. In this New Month, I wish you to have the zeal and courage to struggle and achieve your dreams and also may the blessings of the Almighty help you emerge a conqueror as you strive. Happy New Month. 45. May this New Month be filled with adoration, happiness, and cheers, and may you pass them on to those who live around you too. Happy New Month. 46. Just like a new bloom spreads fragrance around, let this New Month also fill your life with Happiness, Cheers, Joy, and Hope. Happy New Month! 47. Learn from your mistakes in the past months so that you can avoid them in this New Month. My wish for you this new month is for things to go your way and keep that awesome smile on your face all through the New Month. 48. The old month is gone and a New Month is just right in front of us. May you meet all the opportunities that it has to offer so you can use them in gratifying your hopes and desires. Happy New Month. 49. This New Month may you always be at war with your vices and peace with your virtues and may each day of this New Month make you a better and more exceptional person. Happy New Month. 50. We are already in a New Month. As you look forward to witnessing the glory of this New Month, may It bring with it more fulfilled promises. Happy New Month! 51. I am sending you all the good wishes you will ever desire to achieve in this New Month. I hope that this New Month you will continue to swim in the pool of grace as you succeed beyond human expectations. Happy new month. 52. In this New Month, I wish you a glorious and a fantastic start. It’s a brand new month for you to fulfill all your desires which are surely feasible. Happy new month. 53. Happy New Month, my dear. I wish you to achieve the very best of your hopes in the remaining days this month. I know that this New Month will reveal its goodness towards you and your family. Happy New Month. 54. In this New Month, your pains will be in the past, and your gains will be exalted because you shall have dominion over your challenges. Happy new month, I wish you a very blessed month ahead. 55. Welcome to the New Month where you shall regain opportunities to multiply your struggle as you continue to from grace to dominion. I wish you the very best life will offer this month. Happy New Month. 56. This New Month shall bring you Joy, Love, Grace, Hope, Cheers, and Happiness. This Month you shall look fresher and do more significant things than the past months. Happy New Month. 57. I Wish that this New Month will provide a plethora of reasons for you to cheer. I pray that this New Month puts on a higher level. May this New Month bring you glory and dominion. Happy New Month! 58. It is indeed amazing to know that you made it to this New Month. I wish you the very best successes as you journey through life this New Month. Happy New Month. 59. I hope you enjoy a Happy New Month from the bottom of my heart. I pray that this month will never bring negativity to you but rather opportunities to convert them to positivity. I wish you a very Happy New Month. 60. Joy, Happiness, Love, Good Health and many more Fulfilments are my wishes for you this new month. I Wish you a Happy New Month devoid of your worries and sorrows. 61. Never let negativity ruin the fresh breeze of this new month. Make every second count by putting a smile on that face. I love you, and I will keep wishing you happiness all through the new month. 62. I hope you encounter a happy new month, my dear. I have nothing to give you on this beautiful first day of the month than sweet wishes for you. I wish you the absolute blessing of God and the presence of his favor in your life. Have a fantastic new month. 63. You have always been instrumental in my wellbeing, and I am happy to welcome you once more to an excellent brand new month. I wish you more peace and happiness. Keep smiling always. Have a Happy new month, dear. 64. Welcome to the month of smiles and God’s goodness. You are alive because of the grace that covers you. For being such a great and amazing person, I wish you a beautiful new month from the first day of this month to the very last day. 65. Your new month will be brighter than the morning sun, cute as a butterfly and lovely as you are. Have a fantastic month that compliments your beauty. A happy new month to you. 66. Thank you for being the one who brightens my mood when the world seems to be ending. For every encouraging word you say to me, may a smile never leave your face. Go ahead and have a beautiful month of Blessing. 67. You are a blessing because you light up my life with hopes and I gladly exist to give you all the good love you truly deserve. You will have a wonderful month better than the one you just left. Have a great month ahead, my love. 68. I wish many more sweet memories of this new month. I hope you find the excellent opportunities you have been seeking. May there be the manifestation of God’s greatness in your life. Your new month has arrived with love and warmth. They are all for you dear. 69. It is a new month with new adventures and unquantifiable opportunities. Take advantage of this particular first day and change something about your life today. There is power in spoken words, say your wishes and watch how it comes to past. 70. May happiness locate you as you start this new month. May good health be your portion and let God’s will speak in your life. Here is a refreshing new month that will crown all your efforts. A happy new month to you my dear. Live life to the fullest. 71. I do not only wish you a happy new month but another 30 days of joy. Start the month with good thoughts and know that all your heart desires will be fruitful this month. Have a fantastic brand new month. 72. I am passionate as I write to you. I wish you a fabulous new month. Grace into it in grand style and always remember that my prayers and good thoughts are still there for you. Enjoy the new month. 73. Open your heart to possibilities and opportunities this new month. I am sending you a truckload of laughter and happiness that will last you all through the days this month. Know that there is always a reason to be happy as long as you are breathing. 74. Step into the new month with smiles because you are a blessing to those around you. Keep it at the back of your mind that dreams do come to past no matter how big they seem. Chase your goals this month and have fun as you do. Happy new month. 75. I wish you all the happiness heaven can give today because you are about to enter a season of fulfillment. I hope you find the best in this new month. Wear your smile as you go through the days of the month. 76. Have a fabulous new month and may the beautiful colors that come with the month beautify your life. Keep being open-minded and the best will find its way to you. May the month bring you closer to your heart desires. 77. You are steps away from your month of abundance. Look ahead and see the bundle of happiness and bundle of joy waiting for you there. I know that the new month has so much in store for you. Enjoy the incredible feeling the new month brings. 78. You advance as every single day goes by and as further months surface. Accept the new status and get better like fine wine. The new month comes with a change, and I am sure that you will be experiencing a whole lot of amazing things this new month. 79. May this new month bless you will sweet moments that money can’t buy. I wish the new month brings you nothing but the best. May all your unfulfilled wishes be granted. I love you every day, happy new month. 80. Embrace the new month as it approaches you with too many life goodies. I wish you a colorful new month that will leave better than you were in the past. Time is everything and this new month is giving you more time. 81. The new month is here for you. Accept it because it is better than being in the past. Brush up yourself from the disappointments be ready for the next opportunity facing you. Have a fantastic new month. 82. Always keep a smile on your face as you advance into this new month. Check out the opportunities for the new month and know that it keeps getting better. I wish a happy new month with all the love in the world. You are special always. 83. New month presents you with a new life and new opportunities to do things differently. No matter what comes your way, remember to keep a smile on your face because the world smiles at those that are happy with themselves. Happy new month. 84. I wish you all the happiness and pleasures you have always carved for this month. All you have been through in the past month is meant to make you healthy and not break you. Life is smiling at you because it is your new dawn. 85. Let the sunshine of this first day of the month shine on you. I know that your life is about to be more colorful than it used to be when the blessings of the new month come on you. I wish you a fantastic new month. 86. The new month is making your life more colorful and fulfilled as you expect. The love, peace, and happiness that you have secretly wished for will be all yours this new month. Be prepared for what is coming is big. Happy new month. 87. Life is going to be good if it was terrible and it will be better if it was formerly good. I wish you the best of lucks in the forthcoming month and remember that I will keep praying for your heart desires to come true. You are on your path to greater heights. 88. The new month is knocking on your door with a basket filled with love, care, and happiness. Open up and welcome it in because you are the spotlight for the month. Let all your wishes become realities. Happy new month dear. 89. This month is offering you another 30 days of smiles. Will you accept and make the best of the new month or will you reject and dwell in the past? You have the answer yourself. I wish you all the best in this coming new month. 90. I hope you find smiles, joy, and delight in the next 30 days of your life. I wish you a beautiful new month ahead. Knowing that you are happy makes every day of my life better than it used to be. Happy new month, my dearest. 91. I want you to celebrate this new month alongside me because my wishes are for the new month to be beautiful like the butterflies and tender like the flowers. It is another new month of happiness and fun. Have a blastoff new month. 92. I wish you a new month that will bring you the good things in life. You are way closer to your dreams with the passing of each day. Be happy that you are in a new month. I wish you the best at all time. 93. The goodies of this new month in your life will be there for all to see. Approach the month with a winner mindset and new focus. Only with those two tools can you conquer anything that comes to you in life. 94. The new month is a fresh start. A hope to build on and a brand new chance to make thing different from the way they used to be. As you step into the new month, know that life is too short to complain of your loses all the time. Be happy and enjoy the rest of the month. 95. It is a month of merriment. Be the best you can be and keep a clean heart because what the new month brings is far better than what the past month took away. You are on your path to success so keep up the faith and have a fantastic new month. 96. Time doesn’t stop for anybody, and you have to make use of every opportunity the new month gifts you. It is undoubtedly going to be a lovely month for you; all you have to do is make the best out of it. Happy new month. 97. This new month is your new dawn of unending testimonies. There is nothing between you and your destiny. You are in charge now, and I pray your tomorrow to be brighter than your today. Happy new month, dear. 98. On this new month, you only need to look back at the things you left in the past month and thank God. Look forward and always believe that things will keep getting better. Cheers to the goodies the new month have in store for us. 99. Feel the first Sun of this new month on your skin and be happy. Not so many people have the privilege to be alive as you are. As long as you are alive, there is no limit to what you can achieve. Happy new month. 100. Never let your worries weigh you down. As long as you keep breathing, you will always turn your fears around. I wish you a shinning month with loads of sweet wishes. Enjoy every inch of the new month. 101. I pray that you will not cry out a single tear from your eyes this New Month, but rather greatness will surround you. May you be blessed with joy and happiness this New Month. Happy New Month. 102. A Happy new month to you, my dear. The exceptional person in my life, may the ray of sun that ushered today remain a blessing to your life today and forever. I love you. 103. Start today by taking a deep breathe because its the first day of the month. May good fortunes be your all through the new month. 104. Things move and situations changes. Last month left with its worries, and I once again wish you the best of this new month. I love you dearly. 105. Another 30 days are awaiting us. Once more you are presented with a new month to achieve all the things you can think of in life. Make good use of it dear. 106. Every opportunity you missed old month has been made fresh again because you have a complete 30 days to make a difference. 107. The height of our friendship will grow higher. My good wishes for you has been packed and sent through this text. As you are reading it, may all your wishes come true with the goodness of this month. 108. Just like water from a spring, all the impurities left with the old month, and a fresh set of goodies are coming with the new month. It’s right at your doorstep. Happy new month. 109. New days and further months are like brothers. They come, and they go but what we achieve in them remains. Achieve and make the best out of this new month. 110. Stay touching and stay cheery for a new month just arrived with a truckload of joy, peace and a much bigger pack of blessing. Happy new month. 111. We are more powerful than we think. We can only achieve our best only if we open our minds to possibilities. Here is another fresh new month to open our mind to new things. 112. Welcome to our month of showing each other love, more than we did last month. I’m so happy that you and I made it into a brand new month. I can’t wait. 113. Congratulations baby for stepping into this new month with me. As we hope for greater heights from the current month, my love for you will grow beyond bound. 114. Unimaginable height, that’s where my love for you is, today and all through the new month. I can’t thank you enough for being your best all through last month. I pray our love for the new month, surpasses the ones before. 115. My love for you overflows like a stream near a river. I can wish you one thing. Aside from good opportunities and useful life, I wish for us to be forever. I love you, sweetheart. Happy new month. 116. My love for you will never stop. I can’t seem to control what is in my heart for you. You are my morning sun and the purpose of my existence. Let’s enjoy the goodness that comes with this new month. 117. May the new month make you love without doubting, care without minding and smile from your heart. You are my sweetness, and I wish you a happy new month. 118. Launch into this new month with your list of expectations and a little faith for whatsoever you wish for will come true. 119. I pray, the new month makes our thoughts better. Gingers our steps to bring us closer and our hearts to remain together as one. To love you beyond measure. To give you the whole of my heart as we prepare to share a great future. I love you, sweetheart. 121. Welcome to the month of joy and upliftment. You will be a blessing to everyone that comes in contact with you. Happy new month. 122. Today brings forward another opportunity to make things right. I wish you a happy new month, my dearest. 123. There are thousands of reason to give up, but you give me just a reason to keep living. Happy new month. 124. I can do a whole lot, one of them is telling you, Happy new month my sweetheart. 125. Enjoy the feeling the new month brings and make sure the goodies for this new month consumes you. Enjoy dear. 126. May the new month bring you goodness and good health. All your targets and heart desires will come to past as you launch into this new month. Have happy days ahead. 127. Say hello to the new month with smiles because we are about to enter the most impressive month of the year. As you read this text today, I wish you the best in all you do throughout the month. 128. Grab the good things that accompanied the new month. Because it comes only on the first day of the month. Even the good things you couldn’t grab, may they find their way to your bosom. 129. May this month be more memorable that you look back and smile at all you have achieved. All you wished, prayed and worked for will be harvested this month. Have a happy new month dear. 130. Success, success and more success in everything you do this month. May all you achieved in the past months be superseded by this new month’s results. I love you and have a merry new month. 131. My heart has so much gladness that you are mine. Yesterday may not be the best, but this new month brings us loads of fun adventures that our world needs. I love you, Darling. Happy new month.